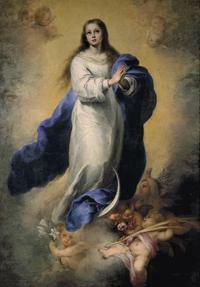 immaculate conception The Feast is celebrated with great emphasis among Catholics today but its official solemnity is very recent. The first signs of its celebration appear in the East between the 7th and 8th centuries. It takes time to reach Western Europe, until we find the feast in the liturgical calendar of Rome in 1476. The immaculate conception of Mary was finally solemnly declared as truth of faith defined by Pope Pius IX on December 8, 1854. Twenty-five years later, Pope Leo XIII elevated the liturgical celebration to the highest rank. The date chosen is related to the September 8, the feast of the Nativity of the Virgin. Between the Immaculate Conception and the Nativity is given the same dependence between the Annunciation and Christmas.